After the debut of a new 450 in 2017, no one would blame Honda for leaving the bike alone for a few seasons, especially with so many other off-road projects in the back room. 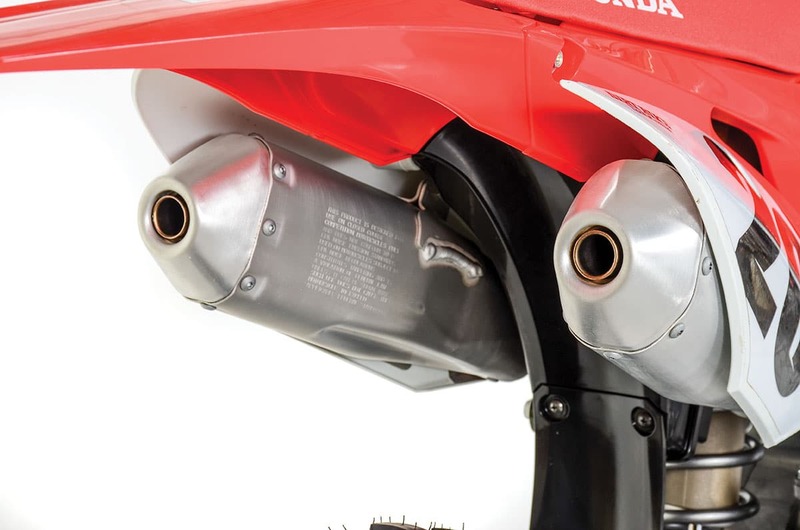 When you look a little closer at the 2019 CRF450R, though, it’s clear that this bike, too, has a lot of new technology and changes. Honda isn’t waiting for anything or anyone. Justin Jones fell in love with the 2019 Honda immediately. For both the standard CRF450R and Works Edition, the CRF450RWE, the one change that shows up in a casual survey is the missing kickstarter boss. When the bike was redesigned for 2017, the big thinkers at Honda weren’t sure if an electric-start-only bike would be accepted by the public, so the bike was delivered with a good old-fashioned kickstarter. The electric starter was to be a dealer-installed option. As it turned out, the electric starter was a nightmare to install, even for dealers. So, in 2017, the electric starter was standard and the kickstarter was an option. Now the transformation is complete. There’s no longer a place for the kickstarter, even if you want one. It isn’t just the outer case that was redesigned, either. The center cases are new and have a larger oil capacity. Honda riders had already discovered that the motor and clutch lasted longer if you increased the oil level in the previous version; now that thinking has been incorporated into the new bike with a rethought oil-management system. The combustion chamber and head have been changed with specific updates near the exhaust port, although Honda is sticking with the single-overhead-cam layout. 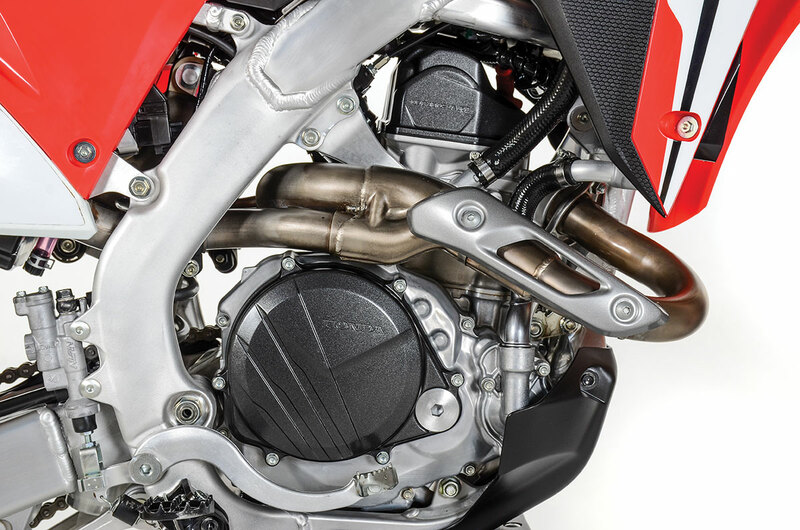 The Unicam design, as Honda calls it, positions the cam so close to the rear of the head that only finger-followers are necessary for the intake valves. Traditional rocker arms are used to operate the exhaust valves. The header is different, and Honda still uses the one-into-two exhaust pipe. Another feature that returns is the three-level map switch on the handlebar. This allows you to change from the standard power delivery to a mild or aggressive one on the fly. All those maps have changed, and this year, the Honda has a gear sensor, which allows the engineers to tune the power delivery for each gear. Honda also gave the bike launch control. This feature is actually operated through the electric-start button, not the map switch. The new Honda might not look much different, but the frame and motor have big changes. It takes someone pretty familiar with the previous Honda to spot the fact that the new frame and swingarm are different too. The motor has a slightly different shape with its new cases, so the frame spar on the right doesn’t have to make a big bend to clear a kickstarter. The new frame is said to be flexible, and the swingarm has narrower arms this year. That’s interesting, simply because KTM and Kawasaki have gone the other direction in recent years, making their frames more rigid. Manufacturers have found that when test riders report harsh or plush traits, they are often dealing with frame-design issues as much as suspension settings. The suspension, of course, got its own changes. The fork is still a Showa with coil springs, but there are a number of valving and internal changes. Same for the shock. Honda still loves the idea of the one-into-two exhaust system. Although it’s hard to justify, we gotta admit, it does at least look cool. There are a few odd things that Honda engineers have been very stubborn about for years despite universal criticism. You know the list: undersized handlebar, no alternative bar-mount positions and those 1990s silver rims. All that changed for 2019. The new Renthal Fatbars can be mounted in four different positions with combinations of offset pedestals and two different mounting holes in the top triple clamp. The rims are now black D.I.D Dirt Stars. Honda also upgraded the front brake with bigger pistons in the caliper and a higher-grade brake hose. For 2019, Honda found more power for the front brake. The pistons are larger and the hose is stiffer. When a popular bike gets a bunch of new part numbers, it can be risky. Honda, however, is shy about taking big risks, especially since the bike has been a hit since its reinvention in 2017. So, while the changes are noticeable, they don’t alter the underlying traits of the machine. The Honda still acts like a Honda. That means two things: it has a very strong motor, and it has quick, light handling characteristics. First things first: the bike is still a brute. 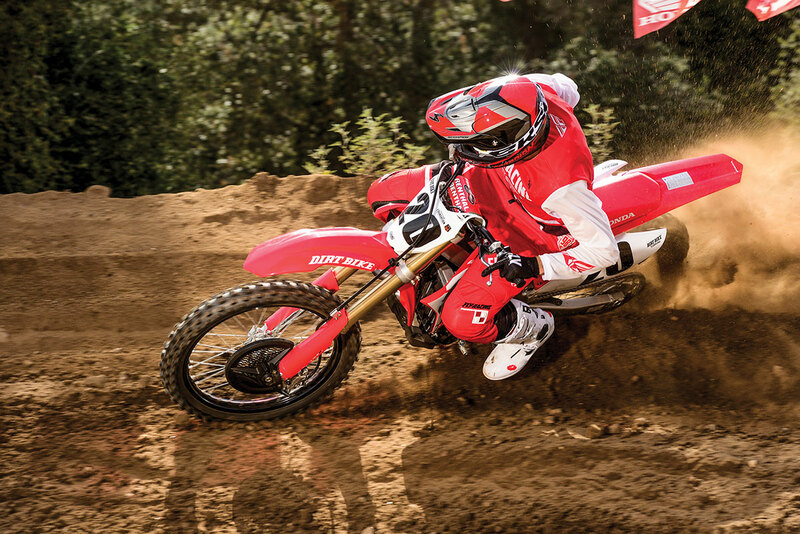 The old CRF was a very quick revver, and it hit its peak at almost 10,000 rpm. Now, it has more peak power arriving sooner. The difference isn’t huge, but if you ride the bike back to back with the 2018 model, you’ll notice. The previous CRF450R’s peak was about 1 horse down compared to the KTM and Husqvarna, and that gap has doubtlessly narrowed. Of course, that was last year. We know that those bikes found more power as well, and so did Kawasaki. Honda’s handlebar-mounted map switch gives you a very distinct change in the way the power is delivered. When you start the bike, the button will flash once if it’s in the standard map. Two flashes mean it’s in the mild map and three signifies the aggressive map. Most riders prefer the standard map. The aggressive one adds a little power to the mid, but it seems to take away revs on top. The mild map mutes the hit slightly. This year Honda gave the bike launch control as well. The starter button activates it. There are three levels, all with different caps on the max rpm limit. The most aggressive one allows more revs, so it’s best for good traction circumstances. Is it useful? Most riders say they think it’s good to have the option of launch control, but few actually use it in combat. Never use it in a race situation unless you have practiced with it, over and over. Hondas have always had a reputation for quick handling. Most riders will even say they feel light, even though that’s clearly not the case. With the coming of electric start in 2018, the CRF450R gained weight and was tied with the Suzuki at 240 pounds, as weighed on our scale without fuel. It was the heaviest in its class—15 pounds heavier than the KTM. All of this year’s changes didn’t amount to much weight loss. It now weighs 239 pounds on the same scale. Still, it’s about as light-feeling as a heavy bike can be. Steering still takes very little effort, and the motor’s revvy, responsive nature gives you the illusion that you’re riding a smaller bike. 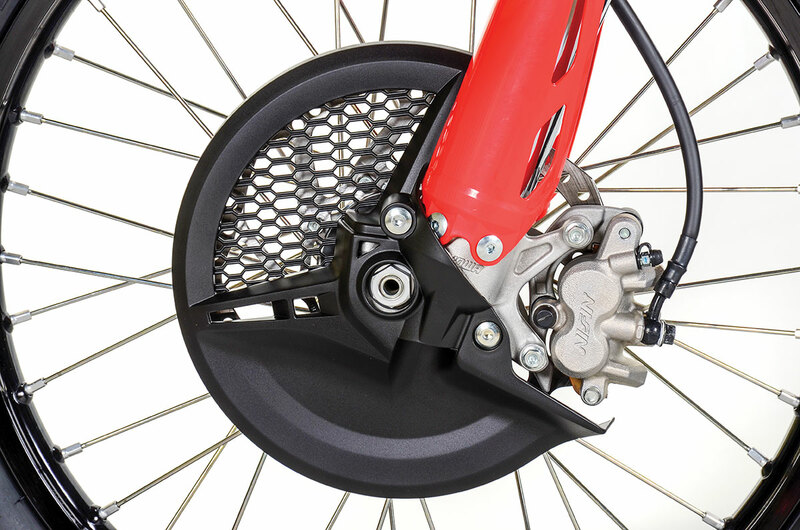 The fact that this year’s front brake is much more powerful helps feed the illusion. You come back to reality when you have to change lines or when you get a little out of shape. In those cases, the quick steering isn’t as much of a blessing. Most riders set up the bike so that it’s a little less lively. We run a little more sag in the rear suspension than we do on most bikes—105mm to 110mm. We also slide the fork down in the triple clamp until the tops are within 1mm of flush. The damping settings vary from rider to rider, but, in general, the bike is happier when you slow things down. That translates to two or three clicks of additional rebound damping in both ends and more compression damping in the fork.As far as suspension action, we have no complaints at all. The Honda is plush and sweet. With such good behavior in rough terrain, it gives you the luxury of setting up the suspension with ride attitude and stability as your number-one priorities; you can be confident that it’s still going to do its primary job on bumps no matter what. The new frame might not look any different, but the experienced Honda riders on our test team could tell the difference immediately. The frame and swingarm only add to the overall feeling of plush suspension. We don’t know what happened internally at Honda to make the 7/8-inch handlebar finally go away. Someone in the accounting department probably went on vacation and didn’t have a password on his computer. The Renthal Fatbar and its multiple positions are a major breakthrough. We wish the same thing would happen in the clutch department. 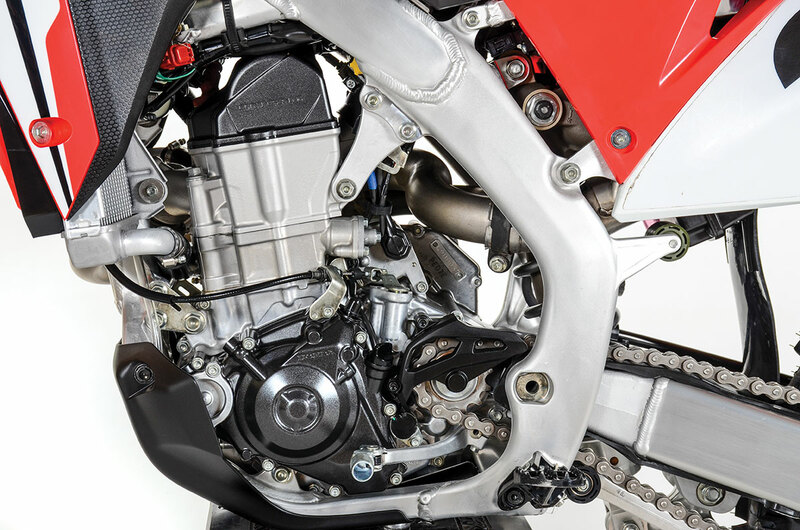 We’ve been complaining about the CRF450R’s clutch since 2009, but the engineer in charge must have seven layers of encryption on his computer. Nothing ever changes. The feel is still vague and the pull is medium-hard.Still, the Honda’s overall quality and reliability are outstanding. 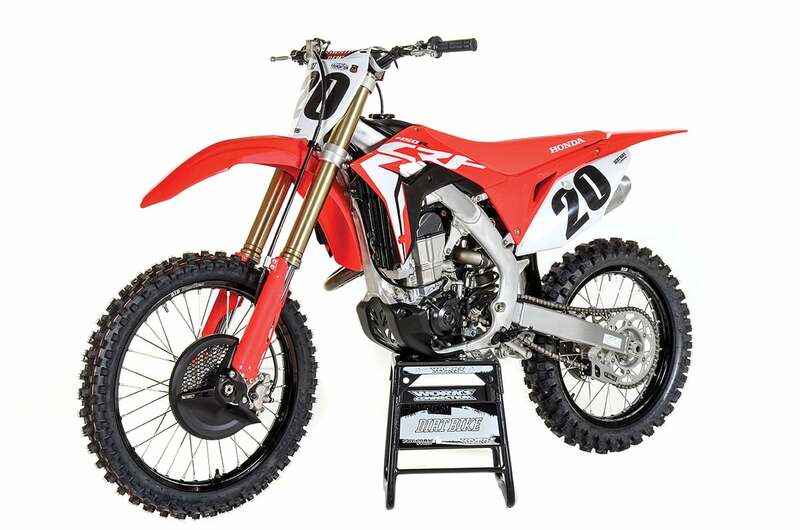 The CRF450R was already the most popular bike in the 450 class, and the new bike is better in almost all respects. The one bike that might upstage it is the Works Edition. Honda’s probably okay with that. 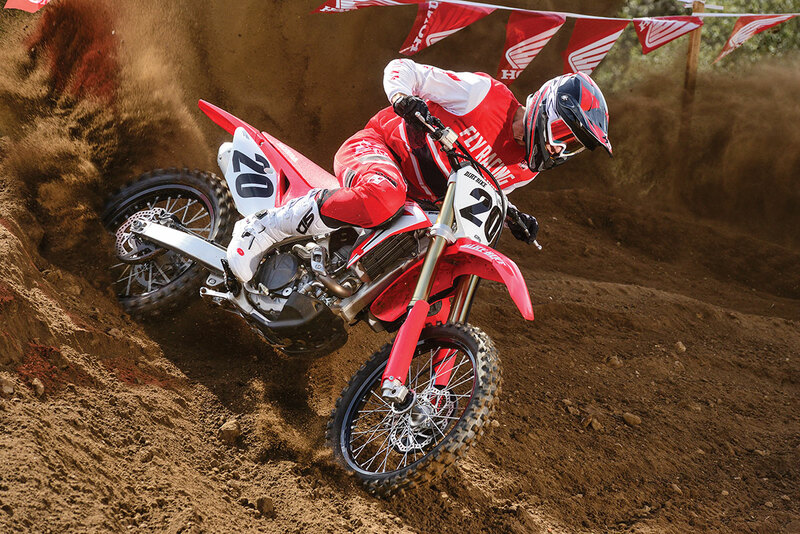 For a comparison between the Honda CRF450R and CRF450RWE, click here. 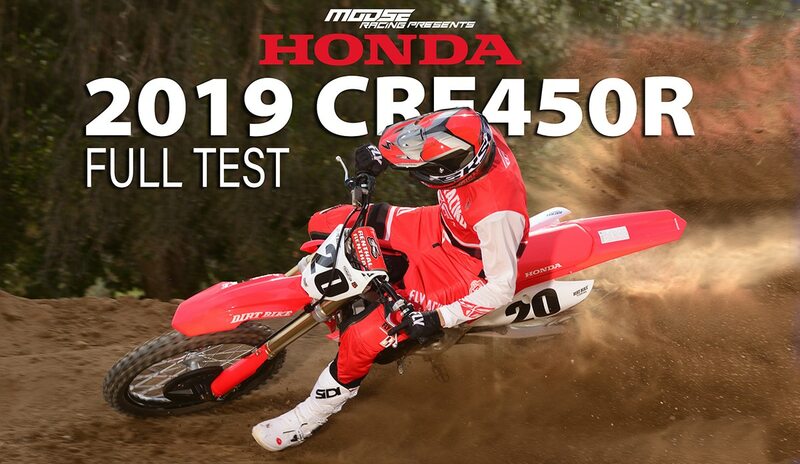 For a video featuring the 2019 Honda CRF450R, click here.